Wow! Number three for Ms. Jody on Ecko Records, and with each release she gets stronger. Never Take A Day Off (Ecko) is her latest. I am told she has built up quite a following on the Southern soul chitlin' circuit. 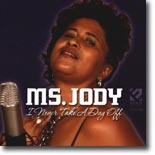 Her sound is somewhat reminiscent of Peggy Scott-Adams, and with Scott's recording career in limbo, who better to fill her shoes than Ms. Jody. It seems that every new Southern CD starts off with a dance tune, and this release's "It's The Weekend" is no exception. The second track, "Energizer Bunny," has Ms. Jody lamenting that her man "goes on and on and on." Not a problem there, Ms. Jody. Remember the timeless Bobby McFerrin words "don't worry be happy." The slower "Lonely Housewife" tones down the pace a bit, and is her first attempt at a straight blues number. My favorite track, "I Might Be Your Part Time Lover But I Won't Be Your Full Time Fool," has all the hooks and cheating lines that make for repeated airplays. It also might set the record for this year's longest song title. This release closes with a lovely ballad, "I'm So Thankful," that really gives her a chance to show off her voice. Ecko's synthesized sound is still there, so either love it or hate it. Their stance is "if it's not broken, don't fix it," and being one of the most successful labels on the Southern soul market, bodes well for that position. It's hard to believe this is Ecko's 98th release. It seems like only yesterday we were enjoying Ollie Nightingale's 1995 release I'll Drink Your Bathwater Baby (Ecko #1001). Thank you, Ecko, for all these years of great music and for touching so many lives the way you do. 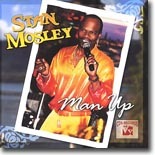 I knew I was going to like Man Up (CDS Records) for two reasons; one, because I've always been a Stan Mosley fan, and two, because he's with a company that understands what it takes to make a quality release. Most of the tracks now feature real musicians and it is my understanding that future releases from this company will aim for the real stuff all the time. Exactly a year ago (March 2007) I reviewed Stan's Steppin" Out CD and said his music was sophisticated Southern soul. I'll stick by that earlier description, but must add that his sound has also evolved to the "that's a hit" party blues sound. With the opening "I Came To Party," you knew this release was heading in a slightly different direction. You can hear the happiness and vigor in the way this release presents itself. The great arrangements and superior songwriting are quite apparent from start to finish. mega hit "Stand Up In It." On "Backbone" he tells us he ain't no Theodis, no candy licker Marvin Sease, but says he just gonna do what he does best, "put my backbone in it." "I'm Startin' 2 Stop (Thinking About You)" is a midtempo track with that unforgettable title hook. "You And Me" harkens back to the sophisticated southern soul tag. One listen and you'll know exactly what I mean. In summation, this is a superior release loaded with potential hits, featuring Stan's gritty, soulful, voice in the forefront and reminding us once again what a great singer he really is. Continuing as an heir to the Johnnie Taylor throne, this release take him one step closer. I'll anxiously await his next release, but until that time, this is the perfect CD for those upcoming hot summer days. Thanks to Dylann DeAnna, Floyd Hamberlin Jr. and the folks at CDS Records for knowing how to do it right. Columbus, Ohio based Sean Carney released his first CD, Provisions, back in 1998, and it was then re-released in 2007 as Provisions � A Second Helping � the CD featured the final recording of R&B legend Christine Kittrell. 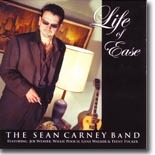 Carney, and drummer Eric Blume formed Nite Owl Records in 2006, primarily for the release of their self-produced CD Life Of Ease, and then went touring in Canada, where the audience response was enormous. During 2007 the band played events all over, including Colorado, Oregon, New York, Pennsylvania and back in Canada. This CD refelects the popularity of the band and also gives an insight into why they are so popular. It opens with the title track, a very laid back jazz/blues fusion and goes on to give a total of 16 tracks, the majority of which are Sean Carney originals. Track 2, �Why Do You Lie,� gets bluesier and ups the tempo quite a bit � a Carney original, this track shows that he knows what the blues business is about. From there, the tempo and style changes throughout the album, giving a good taste of how versatile this bunch of musicians can be. From jazz to blues and back again, this band has it covered � the addition of guests like Teeny Tucker (daughter of Tommy Tucker, who brought us �Hi Heel Sneakers), Willie Pooch, Joe Weaver and others. The CD includes a lovely version of Louis Jordan�s �Outskirts Of Town,� Pee Wee Crayton�s �When It Rains It Pours,� T-Bone Walker�s �I Know Your Wig Is Gone,� and songs by Lowell Fulson. But for me, the highlights of the album are a pair of Sean Carney written tracks, �I�ve Got A Gypsy Woman� and �Pennies & Teardops.� The first is a slow moody track, full of atmosphere, and the second a medium tempo blues, but both top class material � both written and executed perfectly. The last three tracks on the album are live recordings � "Bad Side Baby" and "Why Do You Lie" were both recorded in Denver, Colorado, and "Take Your Shoes Off" was recorded in Florida � they just go to prove that this band is as good live as it is in the studio. The Joe Moss Band is a Chicago-based band that is kept busy playing venues such as Buddy Guy�s Legends & The House Of Blues. Listening to this CD you can understand why they are kept so busy! 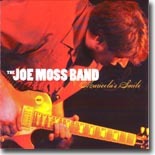 Joe Moss has had a good grounding in the blues, touring Spain in 1992 with Buddy Scott and playing as sideman with Zora Young, Billy Branch, Magic Slim, A.C.Reed & others. His self-titled debut CD came out in 1997, and it was followed up in 2003 by Monster Love. His third album on 212 Records, Maricela's Smile (named for Joe Moss� daughter) draws on the other two and grows up nicely. This CD was recorded in Chicago back in 2006, but has only just been released (March 18th) and it contains 11 original tracks out of a total of 13. The two cover versions are the old Free number, �Fire & Water� (Paul Rodgers & Andy Fraser), and �Big Leg Woman� (Johnnie Temple), and they are both excellent, especially the latter, which is my favourite track from the album. The CD opens with the funky �Suburban Glory,� which gives a good insight into just how good Joe Moss is on guitar, before moving on to �Green Eyes� which is the sort of track I can�t listen to and keep still � Greg Sefner on keyboards and Chuck Desormeaux on sax give this track a real strong flavour. The vocals put me in mind a little bit of Boz Skaggs. There�s a good mix of tempos and styles in this album, from the slow and moody title track, �Maricela�s Smile,� to the upbeat �You Made me So Happy� and �Big Leg Woman,� and from the funky �Suburban Glory� to the heavy blues-rock version of �Fire & Water.� This album has just about something for everyone. I�m sure Joe Moss is going to feature in a lot of people�s CD collections from now on. 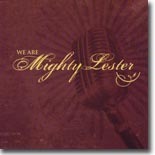 Despite the name of the Mighty Lester Band, there actually is not anyone called Lester. The band began life in late 2000 as a trio that included current guitarist/bandleader Lenny Terenzi and drummer Rick Cassidy. The band quickly expanded to seven pieces, but then went back to the original trio before adding a horn section and a new keyboard player. The new line-up won the Triangle Blues Society 2001 blues competition, and the first CD arrived in 2002. Since then, there have been some changes to the line-up and some more awards picked up � arriving at the band that features on the CD We Are Mighty Lester. The album totals 12 tracks, ten of which are written by band members � the remaining two are a cover of the Ray Charles classic �Greenbacks� (co written by Ray Charles & Renald Richard), and �Let�s Call It A Day,� the Henry Glover track that Ike Turner and Billy Gayles recorded back in the 1950s. The tracks are a mix of soul, blues and jazz, and sometimes a fusion of all three! They all have the big band sound that you might expect from a band with a strong horn section. For me, the best track on the CD is �Last Week�s Blues,� a number written by guitarist Lenny Terenzi, but the cover of �Let�s Call It A Day� comes a very close second, showcasing some lovely moody vocals by Todd Dewberry. I�m sure that we will be hearing a lot more of this band in the future � keep your ears open. Back on the Blues Train (Blues Boulevard) is my first experience of the Pete Scheips Band, yet when I look up their details I find that they�ve played with so many big names: B.B. King, John Mayall & the Blues Breakers, The Fabulous Thunderbirds, Kim Wilson, Johnny Winter, Coco Montoya, Charlie Musselwhite, Marcia Ball, Buddy Guy, Phil Guy, Bo Diddley, Luther Allison, James Cotton, Matt 'Guitar' Murphy, Lonnie Brooks, Jeff Healey, Debbie Davies, and so many others. If they have that sort of profile and reputation, why have they been invisible to me up to now? This CD has just been released (March 2008) under a different name in Europe by Belgium-based Music Avenue as Coming Up Blue. All ten of the tracks on the CD have been written by either Pete Scheips, Stephen Miller (guitar and vocals), or a combination of the two guys, and it�s plain they understand the blues and have absorbed a lot of different influences. On first listen it�s easy to understand why they have opened for and played with so many big names � this is a very competent band! The mood throughout the CD is fairly laid back, and personally I�d love to hear this band get down and dirty, but what they do is good and I�m really looking forward to hearing more from them. Favourite track? The acoustic �Coming Up Blue� (track 7). 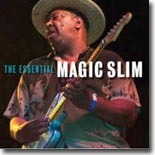 Originally born Morris Holt in Torrence, Mississippi, Magic Slim has been described as �the greatest living proponent of the intense, electrified, Mississippi-to-Chicago blues style.� This statement seems to hold more truth as contemporary blues (as played by others) dwarfs into rock �n� roll and the blues greats pass away. Slim has recorded for many labels during his lengthy career. The bulk of his aggressive recordings have been on Wolf and Blind Pig. The music on The Essential Magic Slim (Blind Pig) � culled from Slim�s six previous Blind Pig releases � is raw and rough, which is just like the Chicago clubs where Slim developed his style of blues. He left Mississippi long ago but you�ll never extract those roots. The country is still in Slim�s heart and soul. Listen as it comes out in an urbanized electric manner on each of these rudimentary sounding songs. Slim�s stinging guitar notes and sandpaper-like vocals prominently feature on 15 gritty, urban, and electric blues songs. The string slashing begins with "Before You Accuse Me" and it continues for a full hour. "How Many More Years" � another one of seven covers � is given an ultra-tough sound that is so heavy, it appears angry. "Think" is a scuffling song that accurately represents Slim�s abrasive blues. It has a basic rhythm and a cutting guitar solo that is extreme. "Scufflin�" is a boogieing shuffle with a guitar solo that sounds like it is being played by Hound Dog Taylor. Slim moved to Chicago in the �60s, and by 1972 he had replaced Taylor as the house band for a prominent South Side blues club. "Black Tornado" is an instrumental lightening rod. In general, I�m not a fan of anyone�s take on "Mustang Sally," but Slim�s version is enjoyable especially thanks to the confident vocal harmonies of John Primer. The Teardrops � Slim�s longtime backing band � were at their best when unheralded guitarist Primer was in the group. Other notable members who appear on these recordings are Michael Dotson (guitar), Jake Dawson (guitar), Nick Holt (bass), and Allen Kirk (drums). The vocals are indeed rough and they are not always comprehendible. That�s alright because its Slim�s vibrato guitar and distinct Chicago blues that people want to hear. As with any Slim disc, there is not a lot of diversity in the songs or their rhythms. Still, the music on this disc is the type of pure blues you can listen to for hours. No wonder he is one of Blind Pig�s most popular artists. Al Basile was originally a writer of poetry and fiction, and was the first to earn a master�s degree from Brown University�s Creative Writing program. A chance meeting with Duke Robillard in the late �60s changed his career path, and he ended up becoming the first trumpet player hired for Robillard�s legendary Roomful of Blues band. He was fortunate to play with many blues and jazz greats, like Eddie �Cleanhead� Vinson and Big Joe Turner, during his tenure with the band, but he left the group in 1975 to teach, sing, and write songs. He reunited with Robillard in the late �80s, and has played and written many songs for Robillard�s albums since then, while also managing to carve out a nice solo career. The Tinge (Sweetspot Records) is Basile�s sixth solo release, and not unlike an early Roomful of Blues or solo Robillard album it effortlessly moves from blues to jazz to swing. There are a few familiar faces present that could account for those similarities, namely Mr. Robillard himself, and former Roomful mates Rich Lataille (the only original member still in the band) and Doug James. The songs, all Basile originals, range from �While We�re Dancing,� which has more than a touch of Satchmo present, �Too Slow,� done in the �Cleanhead� style, and �Just Wait And See,� a soulful jazz tune that gives Robillard room to stretch out. �Airlift My Heart� benefits from a clever lyric, as does �Not The Wrong Woman.� �Give Me The Rainbow� would be a nice fit on a Sinatra or Tony Bennett album. �Daddy�s Got A Problem� sounds like a lost Percy Mayfield track and Robillard provides some tasty guitar. Basile has a smooth, mellow voice and plays cornet on all the tracks. The band, in addition to Robillard, Lataille, and James, included Bruce Katz on keyboards, Mark Teixeira on drums and Marty Ballou on bass. They provide wonderful support in all the various settings. Robillard produced the disc and Lataille and James arranged the horns. Basile�s liner notes also provide helpful insight behind the making of each song. The Tinge is a superlative release that will certainly please fans of blues, swing, and jazz. 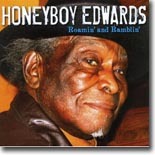 The amazing Honeyboy Edwards recently turned 92 years young and shows no signs of slowing down. Just a couple of weeks ago, he performed with Koko Taylor and Pinetop Perkins at the Grammy Awards (sadly, it was during the pre-broadcast portion) where he also took home a Grammy for Best Traditional Blues Album for his participation in the Last of the Delta Bluesmen project. He also played himself in the recent movie, �Walk Hard: The Dewey Cox Story.� He�s still a powerfully intense performer, and his latest release for Earwig, Roamin� and Ramblin�, serves as solid testimony to his still potent gifts. Producer and longtime friend and associate Michael Frank�s intent was to recreate the duo and small group performances of the �30s and �40s. During that time, Edwards played with several of the future Delta harmonica playing greats, like Big Walter Horton and Little Walter Jacobs. Frank recruited a stellar trio of harmonica players, Bobby Rush, Billy Branch, and Johnny �Yard Dog� Jones, for two sessions recorded last year. These sessions find Edwards in nice form both vocally and on guitar, and he works very well with his partners, which also include Paul Kaye on guitar, Kenny �Beedy Eyes� Smith on drums, and Rick Sherry on washboard. There are some enjoyable spoken-word tracks where Edwards and Rush reminisce about 1950s Chicago and Little Walter. Edwards has always enthralled listeners with his near photographic memory of events, names, and dates and it�s obvious he and Rush had a great time. It would have been great to hear more of their discussions. There are also some previously unreleased songs from the mid �70s, some solo and others featuring Frank, Sugar Blue and Big Walter on harmonica. These tracks show that Edwards hasn�t lost very much over the past 30 years. There�s also a 1942 song, �Army Blues,� from his 1942 Library of Congress recordings. Few people may realize it today, but even though Edwards had been around the Chicago scene since the �50s, he was almost criminally under recorded until he met Michael Frank in the early �70s and they formed the Honeyboy Edwards Blues Band and also played local clubs as a duo. The exposure turned Edwards� fortunes around and he was able to record for several labels during that time. Frank eventually became Edwards� manager and, when he formed Earwig around 1980, he recruited Edwards to appear on his second release for the label, the marvelously ragged and intimate Old Friends (with Sunnyland Slim, Floyd Jones, Big Walter Horton, and Kansas City Red), and later released two other releases of Honeyboy solo. Honeyboy Edwards is a national treasure. Roamin' and Ramblin' is filled with wonderful performances that make you think he can go on forever, and it sounds like that's just what he's planning to do. Canadian Anthony Gomes has been making a lot of noise on the blues scene after moving to Chicago to learn his trade in the mid '90s. Since moving to Nashville several years ago, he's released four albums that have captured his diverse talents as a singer, guitarist, and songwriter. He manages to mix blues, rock, soul, and even the occasional venture into funk and jazz into his performances, and has built a large and loyal fan base. Gomes' latest release on Ruf Records, simply titled Live, will show unfamiliar listeners just what all the fuss is about. Recorded in Seattle at the Triple Door in February of 2007, Live captures Gomes and his band (Biscuit Miller on bass, Todd Hamric on keyboards, and Denis Palatin on drums) in peak form on 11 powerful songs. Standout tracks include "Bluebird," a favorite from the band's 2006 release, Music Is The Medicine, "When The Right Woman Does You Wrong," which sounds like Chicago blues on steroids and features Gomes' best vocal and sizzling guitar, and the soulful "Won't Let You Down," long a favorite on tour, but on CD for the first time. Gomes also tackles Led Zeppelin successfully on the rock classic "Heartbreaker," but his own compositions are first-rate, as always, like "Music Is The Medicine" and "War On War," which is a musical message the whole world should take to heart. The scorching "Testify" closes out the disc, and leaves his audience yelling for more, something you might be doing as well. Anthony Gomes has a bright future, and not just in the blues field. He's got the talent and chops to succeed wherever his muse takes him. 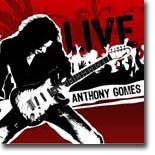 Live is a thrilling, dynamic release that will please blues and blues/rock fans equally. 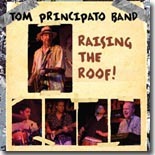 The Tom Principato Band plays an entertaining brand of blues that incorporates elements of funk, jazz, rock, and even reggae. It's a mix that Principato has been honing since his days with the celebrated band Powerhouse in the 1970s. He's also performed with other acts like Geoff Muldaur, Billy Price, Johnny Adams, Sunnyland Slim, Big Mama Thornton, and the Assassins (which also featured Jimmy Thackery). Since the mid '80s, he's embarked on a solo career that has spanned 11 releases, including a pair of CDs with the late guitar legend Danny Gatton. Principato's latest release, on his Powerhouse label, is Raising The Roof! True to form, there's plenty of Principato's marvelous fretwork and plenty of rock-solid support from the band (John Perry � bass, backing vocals, Joe Wells � drums, and Josh Howell � percussion). Also featured is DC-area keyboardist Tommy Lepson, who also contributes vocals, plus a horn section that appears on a couple of tracks. There are nine tracks on the disc, six of which are originals, ranging from the hard-swinging �Lock And Key� to the aptly titled �Too Damn Funky,� to the reggae-flavored �In The Middle of The Night.� There are also a pair of tough instrumentals, �Bo Bo�s Groove,� which sounds like a long-lost Santana track (thanks, in part, to Lepson�s B3 wizardry), and �Mi Solea,� a more pensive, soulful run. The hilarious �They Called For �Stormy Monday� (But �Mustang Sally� Is Just As Bad)� closes out the disc. Cover tunes include a splendid take on J. J. Cale�s �Lies,� a funked-up version of Louis Jordan�s �Fish Fry,� and Jimmy Smith�s �8 Counts For Rita,� which allows for more terrific interplay between Principato and Lepson. All in all, it adds up to another masterful release for Tom Principato.